The Battle of Salt River Canyon, the Battle of Skeleton Cave, or the Skeleton Cave Massacre was the first principal engagement during the 1872 Tonto Basin Campaign under the command of Lieutenant Colonel George Crook. It was part of the Yavapai War from 1871 to 1875. 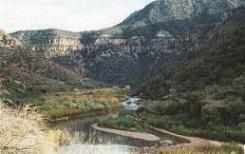 On December 28, 1872, Crook's men encountered the Yavapai stronghold at Skeleton Cave located in Salt River Canyon. Crook's force was composed of 130 troopers from the 5th Cavalry Regiment led by Captain William H. Brown and another thirty Apache Scouts. The army took up a position around the mouth of Skeleton Cave and surprised the natives when they tried to leave. Surrounded, the warriors refused to surrender and the soldiers opened fire. Some of Brown's men aimed for the roof of the cave, causing the deaths of women and children within the cave. Others, who were personally accompanied by Crook, rolled rocks and boulders down from the cliffs above. Seventy-six dead were found in the cave afterward. A few who were captured were taken to Camp Grant. Among the dead within the cave was Chief Nanni-chaddi, who had claimed that no soldier would ever find his stronghold there. Crook followed up this victory with another at Turret Peak several weeks later. The Apaches soon made peace at Camp Verde in 1873 though some skirmishing continued into 1875. Michno, Gregory (2003). Encyclopedia of Indian Wars: Western Battles and Skirmishes, 1850–1890. Missoula: Mountain Press Publishing Company. ISBN 0-87842-468-7.